Katie was moved to a new foster home today. This is the fourth time she was moved since being taken into custody and is the third foster home she has been placed in. Certainly it was wrong to have taken a cancer victim out of her home and away from her parents and family. This can never be in the best interest of the child that has cancer and a loving and caring family that honestly wanted to see that she got the right and best treatment available for her. If the state thought the parents weren't capable why wasn't Katie placed with relatives as required by law? Why did CPS lie in court documents that there were no known relatives to place her with when they had names of all of them and one testified in court she would see that Katie received the treatments? Katie was moved to Houston away from family and relatives, which makes visitation difficult and financially difficult. 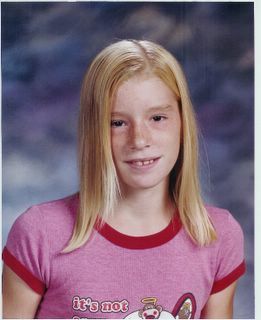 Katie was first placed up there in a foster home with 11 other children with various medical needs. This was a bad medical decision on CPS's part for someone like Katie undergoing chemo and needing to be in a home where no one is sick. The fewer people she is exposed to the better. Now Katie has been traumatized by being moved to another new foster home. She didn't need this mental, emotional, and pyscholigical abuse at this critical time in her treatments. Is CPS guilty of neglect and abuse of Katie? You be the judge. Someone should hire a private investigator to look into the lives of Neejemie Alter and Kim Garcia.This is probably not an isolated incident,but just another link in a long chain of sociopathic actions.Kim Garcia especially needs to be discredited. It makes you wonder what the state wants from this girl. Has she been made part of a covert medical experiment as the parents think? It really makes you wonder. One down ,one to go.I'm sorry about the car windows.Only an idiot, or Dr. Alter, would be angry about his dismissal.God bless Katie.